My parents used to drag a tank of a camcorder to the memorable events of my childhood. It was bulky, could barely focus, and the audio had a distinct Darth Vader quality. The mess of cables from the camcorder to the television created an impenetrable web of confusion, making the playback a unique adventure. 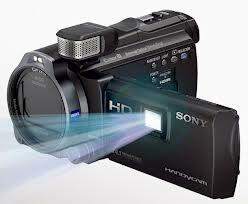 Fortunately, Sony has made video capture and playback a breeze with the new Handycam HDR-PJ650V. It has a built-in projector in a versatile LCD screen for instant playback and allows you to project images and videos from your computer or smartphone. The Handycam's features are impressive. When recording, you can either use the LCD touchscreen or the viewfinder with the LCD screen giving easier access to switching between features on the menu. The Smile Shutter setting on the Handycam allows for a photo to be taken automatically during a recording when a smile is detected. This feature became a game in our house as we competed to see who could get the most auto photos taken of a fake smile. You can take photos anytime while you record by simply pressing the Photo button when you spot a memorable moment. The Balanced Optical SteadyShot feature has taken away the Blair Witch effect from home movies. When I watch my son's recorded soccer games, I usually have to pop a Dramamine to combat the motion sickness from the bouncing picture. However, this key feature eliminates the shakiness and offers smooth, aesthetically pleasing images. With the GPS function on, your movies and pictures will be automatically labeled with the location information. Even if you don't know where you are, the camera does. You can also playback your videos and images based on a map view. For example, you may only want to show someone your home videos from Cancun. Select the map view, and the photos and videos taken at that specific location are grouped together. You can even find your location with the Handycam. The next time you find yourself far from camp while the camera will provide the map view along with the latitude and longitude coordinates of your location. Not only will you be able to find your way through the forest, but you can try your luck at Geocaching. Is the projector DLP or LCOS technology? a brilliant piece for capturing memorable events. A must have in the home.